The process of amyloid proteins aggregation causes several human neuropathologies. In some cases, e.g. fibrillar deposits of insulin, the problems are generated in the processes of production and purification of protein and in the pump devices or injectable preparations for diabetics. Experimental kinetics and adequate modelling of chemical inhibition from amyloid aggregation are of practical importance in order to study the viable processing, formulation and storage as well as to predict and optimize the best conditions to reduce the effect of protein nucleation. In this manuscript, experimental data of insulin, Aβ42 amyloid protein and apomyoglobin fibrillation from recent bibliography were selected to evaluate the capability of a bivariate sigmoid equation to model them. The mathematical functions (logistic combined with Weibull equation) were used in reparameterized form and the effect of inhibitor concentrations on kinetic parameters from logistic equation were perfectly defined and explained. The surfaces of data were accurately described by proposed model and the presented analysis characterized the inhibitory influence on the protein aggregation by several chemicals. Discrimination between true and apparent inhibitors was also confirmed by the bivariate equation. EGCG for insulin (working at pH = 7.4/T = 37°C) and taiwaniaflavone for Aβ42 were the compounds studied that shown the greatest inhibition capacity. An accurate, simple and effective model to investigate the inhibition of chemicals on amyloid protein aggregation has been developed. The equation could be useful for the clear quantification of inhibitor potential of chemicals and rigorous comparison among them. The aggregation and fibrillation of proteins has been commonly associated with numerous degenerative disorders in humans including Alzheimer’s, Parkinson’s, prion’s, diabetes type II and Huntington’s diseases [1–5]. These proteins, called amylodogenics, are also involved in production, purification and formulation interferences of biotechnology and pharmacologic processes [6, 7]. The phenomenon of protein aggregation, led by nucleation-dependent polymerization mechanism, consists in the formation of amyloid fibrils formulated with β-sheet structures in cross-β-sheet arrangement producing insoluble aggregates [8–10]. For example, insulin peptide also generates fibrillar structures under specific conditions such as low pH, high temperatures or organic solvents dilution [11–13]. Those phase transformations are not observed in vivo but are very common, for example, in the clinical preparations of insulin for diabetics . Human amyloid proteins (Aβ) are peptides of rather 39-42 residues. Aβ40 contains 40 amino acids and Aβ42 is the major isoform in the Aβ peptides with 42 residues polypeptide chain and it is the responsible of amyloid plaques generated in Alzheimer’s disorder [15, 16]. In general, much of the success in the future application of chemicals to inhibit the in vivo formation of such fibrils is dependent on the correct modelling and evaluation of in vitro kinetic data in order to establish protocols of action, effectiveness of molecules and dose-optimization of compounds. The kinetic description of amyloid protein aggregation based on mechanistic and thermodynamic approaches have been extensively studied [17–22] and an ample number of plausible mechanisms of nucleation and fibrillation have been proposed [23, 24]. So remarkable, two new and similar proposal: “Ockham's razor”/minimalistic and Crystallization-like Model, have been recently developed. Both have solid biophysical basis and they were successfully applied to describe and explain the experimental data of different amyloid protein aggregation [25–28]. However, the combined effect of anti-aggregation protein agents, e.g. surfactants, osmolytes and food additives, on time-dependent responses has not been modelled by that way or by means of empirical equations. Although the use of empirical sigmoid equations, mainly the logistic equation, does not provide a direct explanation of the molecular steps that underlie in the generation of fibrils, it is a robust tool to examine protein aggregation kinetic data and to address all the phases of the process [4, 29, 30]. In addition, other authors assimilated the parameters from logistic  to those obtained by an autocatalytic mechanism [23, 27]. Nonetheless, that equation is always formulated without the parameters (fibrillation rate and lag phase) in an explicit form hindering the estimation of their statistical error. In the present work, the capability of fit and experimental data predictability of a sigmoid bivariate model that simulates the growth of aggregation process on different proteins along with the effects of inhibitory chemicals on the kinetic parameters is explored in selected cases obtained from the literature. The results reveal its efficacy and validity to analyze the most relevant parameters that describe geometrically and macroscopically the mentioned process. Amyloid protein aggregation data were collected from results previously reported in the bibliography and digitized from the published curves using GetData Graph Digitizer 2.24. The kinetics of insulin inhibition induced by (−)-epigallocatechin-3-gallate (EGCG) were selected from Wang et al. , methylglyoxal effects were collected from Oliveira et al. and those produced by 1,2-diheptanoyl-sn-glycero-3-phosphocholine (di-C7-PC) were described in Wang et al. . Two conditions of EGCG affecting to fibrillation kinetics were used: EGCG_1 (case 1) studied at pH = 2.0/T = 60°C and EGCG_2 (case 2) at pH = 7.4/T = 37°C. On the other hand, the aggregation kinetics of Aβ42 amyloid protein inhibited by apigenin and taiwaniaflavone were selected from Thapa et al. and the data affected by ectoine and hydroxyectoine from Kanapathipillai et al. . Finally, apomyoglobin fibrillation experiments were published in Vilasi et al. . The datasets were obtained by the two most common methods used to probe amyloid formation in vitro, the increment in light scattering of the protein solution due to insolubilization, and the increase in ThT fluorescence due to amyloid binding. where, v m is the maximum aggregation rate, X m is the maximum aggregation growth, λ is the lag phase and C is the chemical concentration. The meanings of other symbolic notations as well as the corresponding units are summarized in Table 1. In the experimental data chosen, the dependent variable of response or time-dependent signals (X) to detect amyloid protein aggregation were absorbance at 600 nm (data obtained from Wang et al. ), relative ThT fluorescence intensity (%) (data from Wang et al. ) and ThT fluorescence intensity at 482 nm or 490 nm (data obtained from Thapa et al. ; Kanapathipillaia et al. ; Oliveira et al. and Vilasi et al. ). Amyloid aggregation growth measured as absorbance at 600 nm, relative ThT fluorescence intensity (%) and ThT fluorescence intensity at 482 nm or 490 nm. Units: absorbance units (AU) or (%). Additionally, a global parameter (EC 50,τ ) was also selected for the overall description of chemical effects on fibrillation growth studies according the algebraic steps previously described . This parameter was defined as the chemical concentration (in mM) that reduces the aggregation by 50% compared to that produced by the control without agent at time (τ) which also reduces the maximum aggregation by 50%. The fitting procedures and parametric estimates from the experimental results were performed by minimizing the sum of quadratic differences between the observed and model-predicted values using the nonlinear least-squares (quasi-Newton) method provided by the ‘Solver’ macro from Microsoft Excel spreadsheet. The confidence intervals of the best-fit values for the parametric estimates (Student’s t test, α = 0.05), consistency of the mathematical models (Fisher’s F test; p < 0.05) and covariance and correlation matrices were calculated using the ‘SolverAid’ macro, which is freely available from Levie’s Excellaneous website http://www.bowdoin.edu/~rdelevie/exellaneous/. An example of the type of Excel spreadsheet used for modeling (Ab42amyloid apigenin case) was provided as Additional file 1. These statistical procedures and residual analysis (Durbin-Watson test) were confirmed and evaluated, respectively, by DataFit 9 (Oakdale Engineering, Oakdale, PA). Moreover, bias and accuracy factors of fittings (B f and A f , respectively) were calculated according to the expressions reported by Ross . In the description of amyloidogenic fibrillation growths, the logistic equation used to formalize their kinetic profiles is always formulated through an explicit expression based on the time required to reach 50% of the maximal aggregation (x 0 ) and a time parameter (τ), although the initial lag phase and the aggregation rate are commonly the most important parameters that need to be calculated . In this work, the logistic equation was reparameterized to make the lag phase (λ) and the maximum aggregation rate (v m ), which represents the overall aggregation process rate, explicit (Figure 1). This last coefficient more adequately characterizes the reaction rate of fibrillation than the parameter conventionally used (k app , defined as specific or apparent rate) because it is less sensitive to experimental error and because it is a more efficient to describe the global rate of the kinetic process . Additionally, the v m calculated from the experimental data obtained by Sabaté et al. for yeast prion proteins follows the Arrhenius dependence with temperature (data not shown). Left, Graphical description of the kinetic parameters ( X m , λ , v m and τ) from the logistic equation ( A.8) and the corresponding aggregation phases: pre-nucleation, post-nucleation and elongation. Right, Simulations of the most common profiles for the parameters (X m •, λ•, v m •), affected by chemical concentration, using the Weibull equations (A.15). In contrast, the fit using the reparameterized functions can be used to easily calculate the confidence intervals of the parameters. The algebraic steps required to obtain the corresponding reparameterization of λ and v m from the logistic equation are detailed in the Appendix. Thus, the parameters from this equation define all of the aggregation kinetic phases : pre-nucleation, which is characterized by λ, post-nucleation, which is represented by v m or τ, and elongation, which is determined by X m .
Figure 2 shows an illustrative set of simulations that were developed under the numerical conditions described in Table 2. In these simulations, all of the possible sigmoid effects of the chemical concentration on the logistic parameters are defined. Weibull’s equation, which was adequately configured to simulate the dose-response trends, is a mathematical tool that provides excellent predictions for varied experimental profiles from different scientific fields [45, 46]. In the present context, the flexibility of this equation to describe different chemical-concentration relationships as linear, sigmoid, exponential, or hyperbolic curves depending on the numerical values of the parameters is particularly valuable. The combination of both of these mathematical resources (1) generates a wide variety of theoretical casuistries that will be verified using the experimental data selected below. 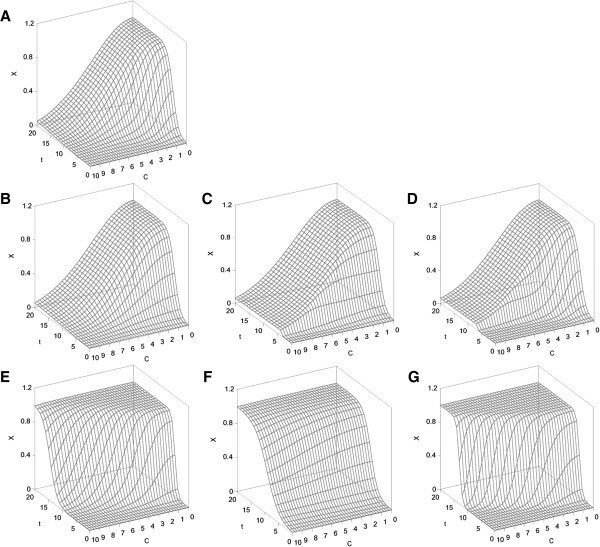 Profiles obtained by simulation under the numerical conditions specified in Table 2 using the equation ( 1 ) and that representing all the theoretical kinetics of protein aggregation process. A: all the parameters from logistic equation (X m , v m and λ) are affected by chemical concentration; B: parameters (X m and v m ) are modified by chemical; C: only the parameter X m is affected by chemical; D: parameters (X m and λ) are modified by chemical; E: parameters (v m and λ) are affected by chemical; F: only the parameter v m is modified by chemical; G: only the parameter λ is affected by chemical. In all cases, time (t), aggregation response (X) and chemical concentration (C) are simulated with arbitrary units. The representation of the experimental data from selected cases and surfaces predicted by equation (1) are depicted in Figure 3A and B. The results of the parameter estimations and the statistical analysis of the fit for the EGCG influence on insulin fibrillation are summarized in Table 3. Both datasets were accurately fitted with equation (1) to obtain R 2 adj values greater than 0.98. Moreover, the p-values obtained from Fisher’s F test indicated the complete consistency and robustness of the equation to the adjustment of the experimental patterns. The residual analysis through the Durbin-Watson test revealed a lack of residual autocorrelation and therefore a random distribution (data not shown). Insulin fibrillation kinetics at different concentrations of EGCG, di-C7-PC and methylglyoxal (points) and fittings to equation ( 1 ) (surface). X: aggregation data measured by absorbance at 600 nm (AU), ThT fluorescence intensity at 482 nm (AU) or ThT fluorescence intensity (%). A: experimental data of EGCG obtained at pH = 2.0 and T = 60°C. B: experimental data of EGCG obtained at pH = 7.4 and T = 37°C. C: di-C7-PC data. D: methylglyoxal data. Statistical values of adjusted coefficient of multiple determination (R 2 adj ) and p-values from Fisher’s F-test (α = 0.05). B f and A f are the bias and accuracy factor, respectively. NS: non-significant. At an acidic pH and a high temperature, the effect of EGCG on the kinetic parameters was not significant for the maximum aggregation rate but statistically significant for X m and the lag phase. As can be observed in Figure 3A, the slopes of the sigmoid curves were parallel to the influence of the EGCG concentration, and the surface can be assimilated to that simulated in Figure 2D but with less effect on X m . These results show a longer pre-nucleation phase, which indicates that EGCG blocks the formation of the seeding nuclei without changing the fibril elongation rate (post-nucleation). This behaviour is consistent with the definition reported by Martins  who denominates the compounds that modify kinetic parameters (for instance in the present case, v m and/or λ) as true inhibitors. 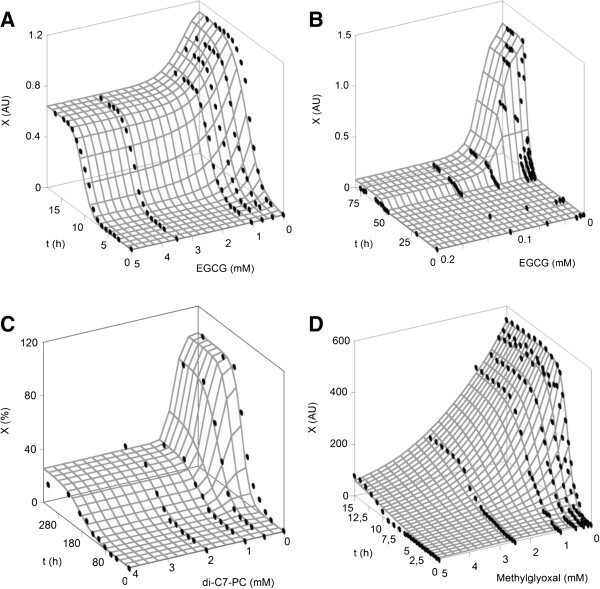 In contrast, different surface and parametric responses were observed for EGCG_2 up to a concentration of 0.2 mM polyphenol with only significant modifications in the maximum aggregation growth parameter (Figure 3B). Under experimental conditions of higher pH and lower T, EGCG acts as an apparent inhibitor that only alters the thermodynamic properties of aggregation process . Higher concentrations of EGCG (from 0.35 to 0.7 mM) led to an increase in the fibrillation response more than the inhibition of the amyloid process . These experimental points were deleted in this mathematical analysis because biphasic aggregation data with profiles of decreasing and increasing values of X m cannot be fitted by the proposed equation or by any other simple equation. The global description of chemical inhibition was calculated by means of a single index: EC 50, τ (Table 3). This parameter can be defined as a summary of all of the effects on the aggregation kinetics observed at the time required to reach the semi-maximum aggregation growth. Thus, the obtained value of this parameter can be used for the comparison and the evaluation of the application of chemicals to reduce the protein fibrillation. The results demonstrated that the most inhibitory conditions for EGCG are established at neutral pH and a lower temperature (case 2), but these conditions require a longer time (τ) to achieve the parameter EC 50, τ. Figure 3C displays the surface described by equation (1) and data on the insulin kinetics in the presence of a surfactant. The parameter values and the statistical characteristics of the modeling were also determined (Table 3). All of the statistical results revealed good agreement and accuracy between the observed and the predicted values, the consistency of the equation, and a lack of bias during the fitting process. Regarding the effects, the two kinetic parameters v m and X m were significantly affected by di-C7-PC, whereas the lag phase was not modified by the surfactant (Student’s t test, α = 0.05), as determined in the simulated conditions defined by Figure 2B. This result is in agreement with data reported for different systems of effector/protein, such as copper/β-amyloid  or glutathione/hen egg-white lysozyme, although these data were obtained using a non-mathematical approach . The value of EC 50, τ was similar to that obtained for EGCG (case 1) for a lower initial concentration of insulin, but a much longer time was required to obtain this parametric value (150.68 h). Similar inhibitory responses were also observed with methylglyoxal; thus, v m and X m were the kinetic parameters inhibited by this aldehyde form of pyruvic acid (Table 3 and Figure 3D). Under an initial insulin concentration (3 g/L) that was higher than the initial EGCG concentration, methylglyoxal effectively reduced the aggregation growth (0.33 mM) within a shorter time (3.9 h). Both chemicals (di-C7-PC and methylglyoxal), under the experimental conditions assayed, showed similar features of true inhibitors . The application of the proposed methodology may help the design of optimal strategies for the reduction of the fibril deposition of insulin in commercial preparations. The dependence of the kinetic parameters of fibrillation on the apigenin and taiwaniaflavone concentrations is represented in Figures 4A and B. Both response surfaces were similar to that defined by the simulation shown in Figure 2A. The three parameters (v m , X m , and λ) were clearly and significantly modified by these chemical doses (Table 4), which show a longer pre-nucleation phase, a lower elongation rate (post-nucleation), and a lower elongation stage. Such responses confirmed their chemical features of true inhibitors, being the only case in which both kinetic parameters (v m and λ) significantly affected aggregation process . All of the statistical tests corroborated the perfect agreement between the experimental and the theoretical data (e.g., R 2 adj > 0.99). The bias and accuracy factors (B f and A f ) were also indicative of the good fitting quality obtained with model (1). Amyloid protein aggregation kinetics at different concentrations of apigenin, ectoine, taiwaniaflavone and trehalose (points) and fittings to equation ( 1 ) (surface). X: aggregation data measured by ThT fluorescence intensity at 482 nm or 490 nm (AU). A: experimental data of apigenin. B: taiwaniaflavone data. C: experimental data of hydroxyectoine. D: data of trehalose affecting apomyoglobin kinetics. The case of apomyoglobin affected by trehalose is also shown. Statistical values of adjusted coefficient of multiple determination (R 2 adj ) and p-values from Fisher’s F-test (α = 0.05). B f and A f are the bias and accuracy factor, respectively. NS: non-significant. The numerical values of EC 50,τ confirmed the superior antifibrillogenic capacity of the biflavonoid taiwaniaflavone (EC 50,τ = 0.91 μM) compared with the monoflavonoid apigenin (EC 50,τ = 2.45 μM). However, the time τ was quite similar in both cases. This affirmation is consistent with the conclusions reported in the original work conducted by Thapa et al. . Different types of molecules have been recently suggested as drug candidates for the treatment of neurodegenerative disorders caused by the anti-aggregation properties of amyloid proteins . One of the most interesting candidates are osmolytes (compounds that protect against the osmotic stress), such as the ectoines that are obtained from aerobic heterotrophic bacteria . The response surface for hydroxyectoine (Figure 4C) shows a behavior that is similar to that obtained with the simulation shown in Figure 2B. Based on the numerical fittings summarized in Table 4, it was statistically demonstrated that osmolytes inhibited the maximum aggregation rate and the maximum fibrillation growth. In contrast, no significant changes in the lag phase were observed. Therefore, both osmolytes effectively blocked the post-nucleation and the elongation stages but not the pre-nuclei formation. In addition, ectoine was much more effective as an antineurotoxic (EC 50,τ = 0.96 mM) than hydroxyectoine (EC 50,τ = 2.20 mM). 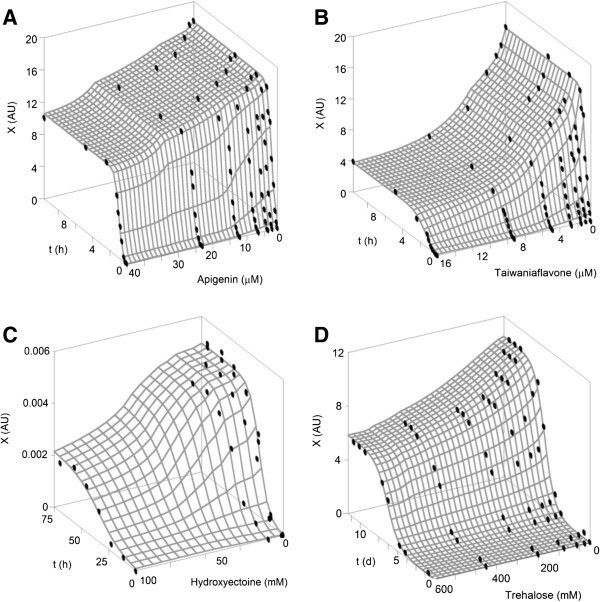 The effect of trehalose on the apomyoglobin aggregation kinetics was also studied using model (1), and excellent statistical results were obtained from the modeling and the description of the experimental data (Figure 4D and Table 4). As in the previous case, the disaccharide significantly inhibited the two kinetic parameters v m and X m without affecting the pre-nucleation phase (λ). Nevertheless, its relative efficacy was obtained at a much higher concentration (21.43 mM), and much longer times (6.5 d) were required than compared with the other cases studied. In summary, a general bivariate model that combines the logistic equation for the description of kinetics and the Weibull equation for the chemical-concentration response has been proposed for the characterization of the inhibitory effects produced by several chemicals on the growth of the aggregation of amyloid proteins. In all cases, the inhibitory effects on the kinetic parameters were established, and the theoretical response surfaces were in perfect agreement with the selected data. In addition, the recent definition of true and apparent inhibitors reported by Martins  can be also evaluated and validated. EGCG at pH 7.4 and a temperature of 37°C was the best option for the reduction of the formation of insulin fibrils (EC 50,τ = 6 μM) but the shortest time (τ) was obtained with methylglyoxal. For the Aβ42 amyloid protein, the biflavonoid taiwaniaflavone produced the highest inhibition response at the lowest dose (0.91 μM) and the shortest time (0.65 h). The bivariate equation was validated using data obtained by two methods based on different chemical phenomena. Although this model can not define the mechanisms of action of chemical inhibitors on protein aggregation, it provides a consistent tool for the comparison of the ability of such compounds in the inhibition of the protein fibrillation process, regardless of the method used for its determination, and is a first step for the optimization of the in vitro application of them. Further experiments and corresponding modeling should be done to establish its validity for in vivo applications of anti-aggregation chemicals. where, Y is the response and Y m the maximum response, m is the concentration corresponding to the semi-maximum response, C is the concentration and a is a shape parameter related to the maximum slope of the response. When the equations (A.15) are inserting directly on equation (A.10) or (A.11), the bivariate model (1) is obtained. The authors also thank the Unit of Information Resources for Research (URICI-CSIC) for the co-financing of this publication in Open Access.